To fully enjoy ise fishing, you’ll need a proper shelter. 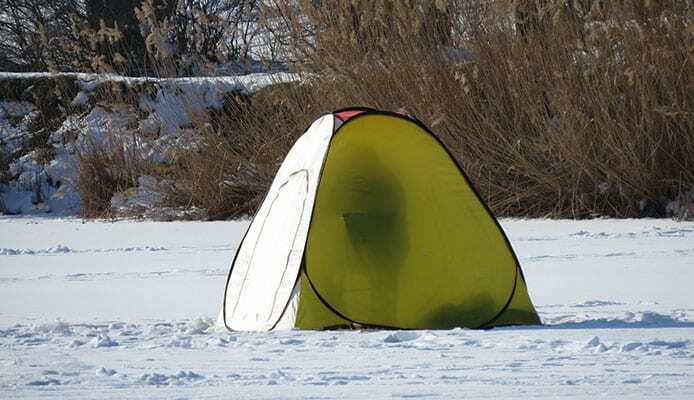 Having an ice fishing shanty will protect you from cold weather, provide you with a place to sleep and will serve you as a hideout if the storm or any other possible problem hits while you’re on ice. 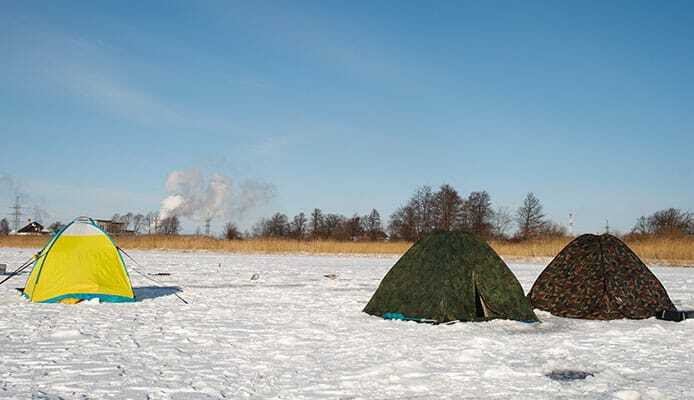 Although there is an option of buying an ice fishing shack, it may not be possible as they are expensive, or you’d simply like to taste the real feel of wilderness and make the shanty by yourself. If you choose to do that, don’t worry, it is not as hard as it sounds. You won’t be able to place it in your backpack, but it will be easier than you think. This article will show you the best way on how to easily build one that will keep you safe, warm and dry and let you concentrate on your adventure instead on your survival. The shelter built this way should be able to hold three anglers, and provides exoskeleton type of space, meaning you’ll have more than enough space for your winter clothes while it remains snag-free, while letting you relax when needed. Building an ice shanty should start with the frame for the floor. Cut five 2” x 4” boards to 45 inches each. After that, lay the two 2’ x 4’ x 8’ parallel to each other, spacing them 24” apart and center to center before you start to screw them into the place. Use the deck screws. Once you screwed them all in, it is time to nail the pieces of scrap wood to the underside of the floor. Make sure they are 0.5 inches thick and 8 feet long. They’ll work as runners on the ice. If you’ve decided to use the wood sealer, add it now, before you attach the thick sheet of plywood to the frame. Once the wood is sealed, take the thick sheet of plywood and attach it to the floor using deck screws. Before you start framing, flip the frame over so the runners are on the ground before you start. This is one of the crucial parts of building. To build a back wall support cut five 2′ x 4′ x 8′ boards. They should be 52 inches long with 26,5 degree angle on the top side. Attach them to the back wall and space them 24 inches apart, same like the floorboards, center to center. Make sure that the corner boards don’t overlap with the sides of the floor. Crucial as the back wall supports for the building, the sidewall supports should also be the same size – 52 inches long and with 26.5 degree angle on one side. Cut them using two 2’ x 4’ x 5’ boards. Once done, connect them to the back supports and fasten with the deck screws. Then it is time to cut two 2′ x 4′ x 8′ boards with a total length of 52 inches and a 26.5-degree angle at the top. When done, you should attach them to the floor. Same as back wall support, don’t allow them to overlap to the front. For the roof supports you’ll need to cut five 2’ x 4’ x 8’ boards with a total length of 56.5 inches, and you won’t need the angle. Square them up and attach them using the deck screws. The total length of the front door support should be 75.75 inches, with also 26.5 degree angle at the top of it. For this, use two 2′ x 4′ x 8′ boards. Square them up with the wall supports, then attach them with the deck screws. Create the top span by cutting the 26.5 degree angle on the side of the 2′ x 4′ x 8′ board, square it up and attach using deck screws. Once you’re done with the supports, the time has come to add the wooden panels to the frame. You’ll need the wood glue and the finishing nails to do this right. Start with the back panel, as it will probably fall into place without any additional cutting needed. When you switch to the sidewalls, measure the dimensions and cut them carefully. They will be a little different because of the lumber yard warping. The dimensions should be 6′ x 4′ x 4′ with a 26.5-degree slope. For the roof, you’ll need a full panel, with some of those scrap strips left from the door cut. They will serve to fill in the last few inches of the slope. The last part before you head to the finishing touches are the doors. They should keep the heat in, while also keeping the possible rain or snow or any other element outside. Cut the two 4’ x 8’ panels to 4’ x 6’. They should be 46 inches wide. Then use the 2’ x 4’ x 8’ boards or split the 2’ x 4’ x 8’ into 2’ x 2’ using the table saw, which will reduce the doors’ weight. Add the wood trips to the panel with wood glue and finishing nails, then let the glue dry. When the glue is dry, attach the hinges and add the doors to your building. Congratulations, your work is almost done! The main part is over, now you should have some fun. First, of course if you want, you could paint it. Then, add the weather sealing products to keep it in a good shape for the longer period of time. Inspect the edges, if you see a hole fill it up with the silicone caulk to prevent the rain or wind from reaching in. If you want, you could now find the place for the jigging holes on the floor, or build a place for sitting and sleeping. You could also cut the windows, to have a better view on what is going on around you, and also to improve the ventilation. But don’t forget – all of this will add some weight to your building and will make it heavier to transport. It may seem complicated at first, but once you start you’ll see how easy it is to build a shelter for your ice fishing adventure. So next time when you plan on heading to the lake for ice fishing, think about this. It will not only be the fun activity for you and your family, but you’ll also have the sense of pride once you get there. Now put on a hat, wipe your sunglasses, sit back in your chair, place your boots on your bucket and let the fishing rod do its work.